This episode is going to have a profound effect on you and how you feel about yourself and how you are about to make someone else feel. I share with you how to write the perfect letter to someone that needs to know how much you love and appreciate them. I just got the most amazing letter in the mail! Honestly, that is the true reason why I recorded this episode… to share that letter with you all. My beautiful friend, Dr. Mcayla, wrote me a letter and it truly touched my heart. So much so that I wanted to teach you all how to make others feel as touched. In this episode, I will share with you how to execute the most beautiful, heartfelt, sincere letter for your loved one this year… whether it’s for Valentine’s day or not. Thanks for tuning in! Part 1 – Put their name (or nickname) in writing. Yout first sentence should explain WHY you’re writing the letter. Part 2 – list one quality that others may not see as obvious about this person. Part 3 – List 1 thing you know is important to that person. Part 4 – Recall a particular conversation and validate it. Part 5 – Write about what you are excited to see happen in the future. Part 6 – Mention a tiny overlooked action or behavior that others wouldn’t notice. This should be something this person does not realize you love about them. I want to hear how you liked this episode. 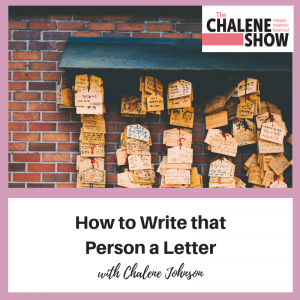 If you decided to write a letter after tuning in to this episode, send me a message and share with me how these steps helped you and how writing a letter to a special someone has had a profound impact on YOU. Love you! Want to have the best sleep of your life? Get the mattress my husband and I have in our bedroom, today! Go to sleepnumber.com/chalene and find a Sleep Number store near you!